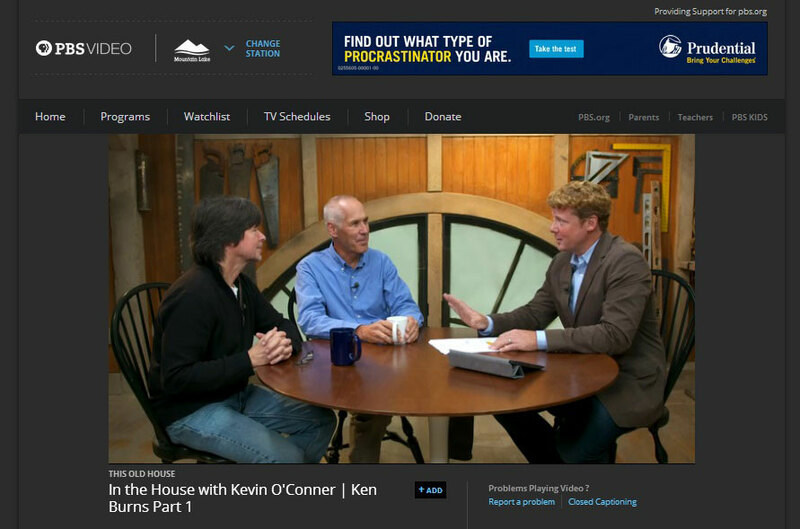 On In the House, a three-part series now available on the PBS website, award-winning filmmaker Ken Burns and Bensonwood’s Tedd Benson, join This Old House host Kevin O’Connor, to discuss Burns’ timber frame barn that combines the unique spiritual feel of 19th century New England with modern-day functionality and comfort. In a conversation with O’Connor, two stewards of American history, Burns and Benson, offer their shared perspective on the values, teamwork and community behind their two very different yet related American trades. Using Burns’ recently completed Bensonwood barn as the central focus of the film, they discuss the practical, spiritual and community values behind these agrarian cathedrals. In their discussion, Burns and Benson laud American barn architecture for its elemental simplicity, honesty and truthfulness; where there are no tricks, nothing is hidden, and its magnificent structure remains permanently on display for centuries. Through this lens, the barn becomes a metaphor for the democratic values and commitment that built this country. In Part 1, the men delve deep into the artistic and collaborative process, and the philosophy of filmmaking through the lens of building. In Part 3, Tedd Benson presents the distinct American timber barn history and Burns highlights the practical and spiritual dimensions of those spaces, calling them “the most powerful of art forms.” Burns demonstrates his depth of understanding of Benson’s craft and his dedication to honoring the building through humility and teamwork. Tedd and Ken talk about the emotion and joy that comes with a good old fashion American barn raising. With time running out and their prospective home site building permit deadline fast approaching, a couple from Iowa was in a race against time. 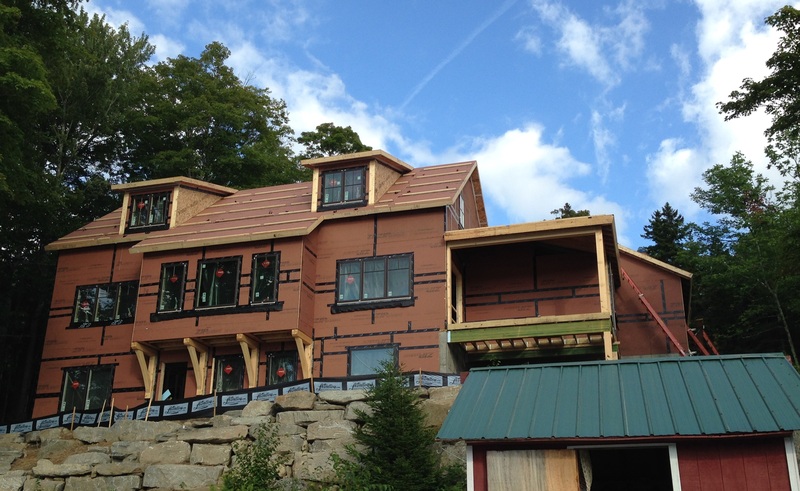 The 3,000 SF custom home they wanted to build on a steep, challenging site on a southern Vermont lake had to be designed and substantially completed by mid October 2014—and it was already late February. To make matters worse, without the building documents in hand the prospects wouldn’t be able to combine their (higher-rate) construction loan with their (lower-rate) mortgage to shorten the former and avoid two closing costs—and besides, they could not close without knowing if they could complete their home before the existing build permit expired. With just a little over seven months remaining to build, the couple turned to Bensonwood. They were familiar with another home we built on the same lake, and as long-time fans of the PBS television series, This Old House, they had seen Bensonwood featured on the program and thought our processes might hold the key to streamlining the process. We accepted the challenge. Within a few days the Schematic Design contract was drawn up. Next, architect Randall Walter, landscape designer Tim Calabrese and the owner all met to walk the build site in snowshoes. The landscaper was brought so early because setbacks on the property were so tight, and the property so steep, site work and landscaping would need to be completed first as there would be no room to bring in heavy earth moving equipment once the home was up. From there, the Bensonwood design and engineering teams finalized plans for the custom home in a few months and detailed construction documents were presented to the lender, who was then able to approve a combined construction and mortgage loan. The home was fabricated off site into panelized assemblies and timber elements concurrent with site prep. 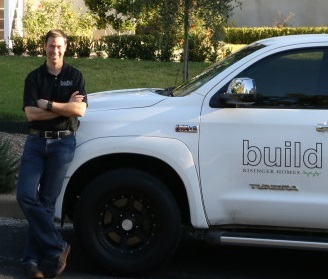 Simultaneously with work by our in-house interior designer, Jenny Fulton, project manager Tony Poanessa coordinated the in-house teams, on-site sub contractors and just-in-time deliveries. With all the pieces in place, the home’s shell was erected within a week’s time in August by our raising crew, headed by job captain Iver Bowen, and site supervisor Mark Williston. The completed home will be ready by October—a little over seven months after the client first visited Bensonwood. An admitted This Old House fanatic, Matt Risinger had grown up watching the PBS television series when, in 1989, a program aired that would change his life. The Wickwire Barn Series—the second time Bensonwood had appeared on the long running home improvement program— featured Tedd Benson and an old barn being converted to a new house: a project Matt had dreamed of building for himself someday. It became the seminal moment in his decision to become the best builder he could be. Fast forward nearly two-and-a-half decades, and architect Andrew Plumb of award-winning Aamodt / Plumb Architects in Cambridge, Massachusetts, is looking for a builder to help assemble and finish out a highly custom modern timberframe ranch home he designed for a special client he has known for years. The lakeside project , expected to approach near Passive House standards, would have an aggressive build schedule of one year, and it needed to come in at a fixed budget—so Andrew knew it had to be done right. His first thought was to call Bensonwood for its expertise in the sustainable fabrication of high performance homes, and his second thought was to call green builder, Matt Risinger, now of Risinger Homes, to say Tedd Benson’s company would be fabricating and installing the home’s shell. With the name “Benson” still fresh in his mind after a quarter century, Matt jumped at the opportunity. The home plan, viewable on the Aamodt / Plumb website, is a interpretation of the Texas Ranch vernacular, with two gabled buildings joined by a light-filled entry hall. Designed for a young family, this prefab home strives to create a relaxed, contemporary feel through the use of natural and reclaimed materials, ample daylighting and a thoughtful relationship to the site. “We sought to create a warm modern atmosphere through the interplay of simple forms, materials and natural light,” says Plumb. 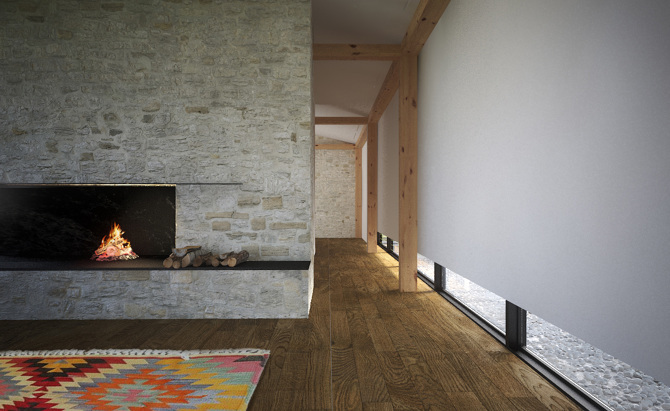 The play of the modern and rustic is achieved through material choices and elemental forms. 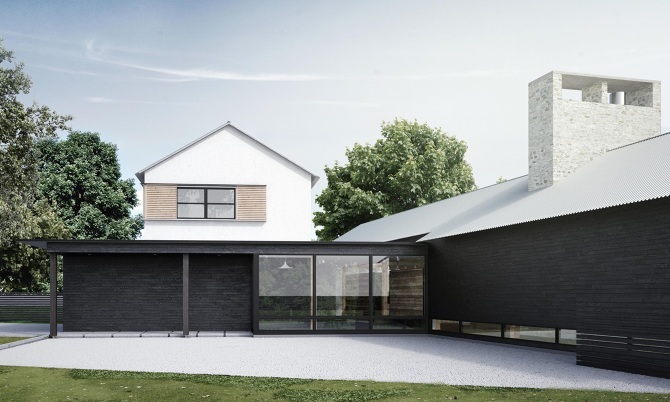 Japanese (Shou Sugi Ban style) charred wood siding, mesquite and ash flooring, and an oversized FireRock masonry chimney and fireplace add a dramatic touch both inside and out. The light-filled open interior, with its elegant but simple timberframe, richly-finished flooring and high-end fixtures, perfectly complements the striking exterior while framing the surrounding views. 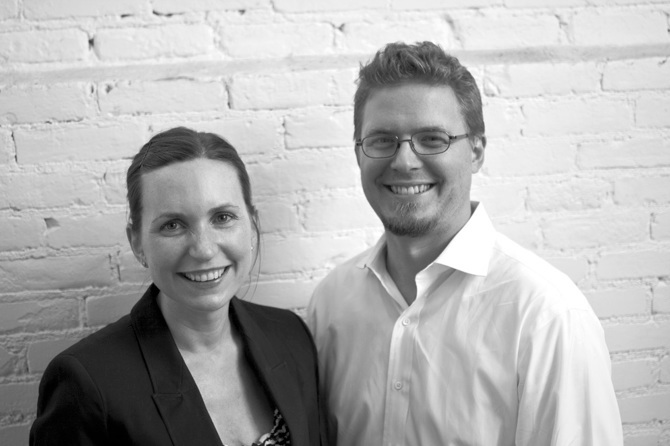 Matt Risinger asserts that, “The most sustainable house is a pretty one. Architect-designed houses will be loved and cared for because they are beautiful. Ugly houses will fall into disrepair and be torn down eventually.” Beyond the aesthetics, this house was designed to coast through the hot parts of the day with little need for air conditioning. This is achieved through rigorous attention to air sealing and our panelization process using super-insulated walls. All the exterior claddings are installed over a rain-screen air gap. The roof, wood siding and even stucco have an air gap behind them so that the potential for water intrusion over the life of the building is minimized. Risinger installed super-efficient mechanical equipment to make the best possible use of the resources consumed. 95%+ efficiency gas equipment, super high-efficiency AC, Ultra-Aire Split Dehumidifier prevents mold and allows the owners to keep thermostat settings high when the building is unoccupied. You can watch Matt Risinger’s YouTube video of the home being assembled here. Once the project is completed and finish photos become available, we will revisit this home to detail its space plan. Stay tuned. Living Green: Should I Build New, or Retrofit an Existing Home?